Integrated spreadsheet with 1 048 576 rows and 16 384 columns. Correct handling of missing data. Outliers can easily be excluded. Imports Excel, Excel 2007, SPSS, DBase and Lotus files, and files in SYLK, DIF or plain text format. Easy selection of subgroups for statistical analysis. Manual in PDF format (go to download area). Complete HTML manual on MedCalc web site. Context help in dialog boxes. See list of statistical procedures. Area under the curve (AUC) with standard error, 95% confidence interval, P-value. Offers choice between methodology of DeLong et al. (1988) and Hanley & McNeil (1982, 1983). List of sensitivity, specificity, likelihood ratios, and positive and negative predictive values for all possible threshold values. ROC curve graph with 95% Confidence Bounds. Threshold values can be selected in an interactive dot diagram with automatic calculation of corresponding sensitivity and specificity. Plot of sensitivity and specificity, or cost, versus criterion values. Plot of predictive values versus prevalence. Comparison of up to 6 ROC curves: difference between the areas under the ROC curves, with standard error, 95% confidence interval and P-value. Sample size calculation for area under ROC curve and comparison of ROC curves. Go to the ROC curve analysis section of the MedCalc manual for more information on ROC curve analysis in MedCalc. Lots of graphs, see Graph gallery. Data point identification in graphs. Draw text boxes, lines, arrows and connectors. Name, save and recall graphs and statistics. 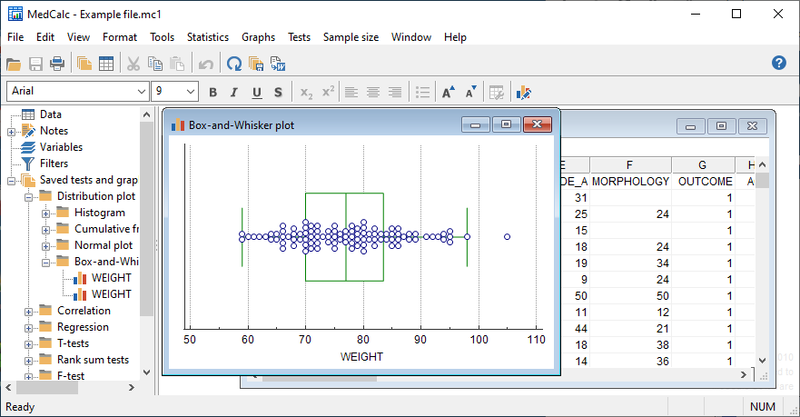 Statistical info in graph windows. Save graphs as BMP, PNG, GIF, PCX, JPG or TIF files, or as PowerPoint slides (*.pptx). (all 32-bit and 64-bit versions supported). support for Excel *.xlsx files additionally requires Microsoft . NET Framework 4.0 (a free download from Microsoft). 20 Mb free space on the hard disk.